Due to agricultural revolution, most of the activities on the filed are done by Tractors, due to which "Bulls" have lost their relevant for farmers. Lord Shankar had given name of "Pothiya" to Bull, but in today's world, they are ignored and deserted. 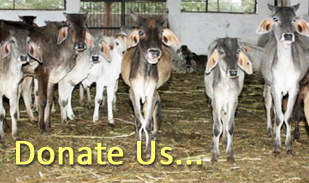 People preserve, maintain and take care of Cow as they give milk, but Bulls are ignored and deserted by people at large. Today only "Panjrapod" take care of Bull and save Bull from going to Slaughter House. Our Panjrapod, with help and support of generous donors is able to save, take care and maintain these deserted, ignored, injured, old age and weak animals.